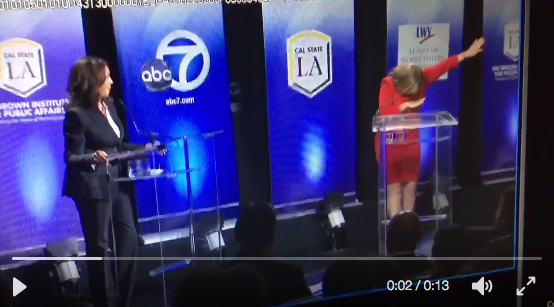 Loretta Sanchez Dabs During U.S. Senate Debate, World Wonders WTF?! Last night at Cal State L.A., the only scheduled debate for the California U.S. Senate race between OC's own Loretta Sanchez and attorney general Kamala Harris ended on what seemed like a bizarre note. After giving her closing remark, going way over the limit that moderator and KABC-TV Channel 7 anchor Marc Brown gave her, Loretta's final point? A dab. Since Orange County has no black people, let us quickly explain what a dab is. It's a dance that got popular in Atlanta's hip-hop scene earlier this decade that involves the dancer bowing their head down while pointing one hand at a 45-degree angle to the air and the other thrust strongly in front of the head—think of it as a G curtsy. The dab was thrust onto the national stage last year after Carolina Panthers quarterback Cam Newton used it as a touchdown celebration. And now it's been appropriated by Loretta, one of the uncoolest people on the planet, which means the dab has officially joined Tebowing and planking as stupid millennial gestures gone the way of the Watusi.